Uglyworld #1227 - Saturday Night Snackers (Project BIG 225-365), a photo by www.bazpics.com on Flickr. Today I has spentered the entires day workerings on the new websiter, and I has managered to gets loaders of pages ups and runnering with their galleries too! 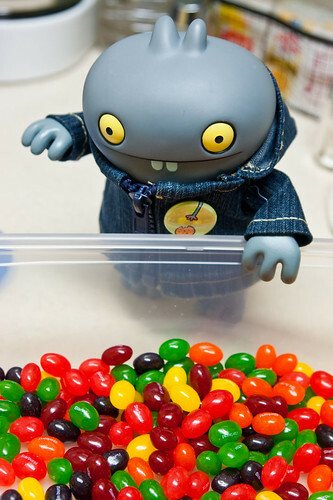 While I was workering on the websiter, Baz poppered out to grabbers us dinners, and then laters on he surprisered me withs a huge tubber filleds to the tops with tasty jellybeaners! Perfects saturday night snackers, even if I does says so myselfer!